YOURS FREE - The ONLY comprehensive free owner builder e-kit online. Site e-Diary, Cash Flow Manager, Area e-Calculator, Volume e-Calculator and Bar Charts. Full Safety Management System, Contract Templates and more. 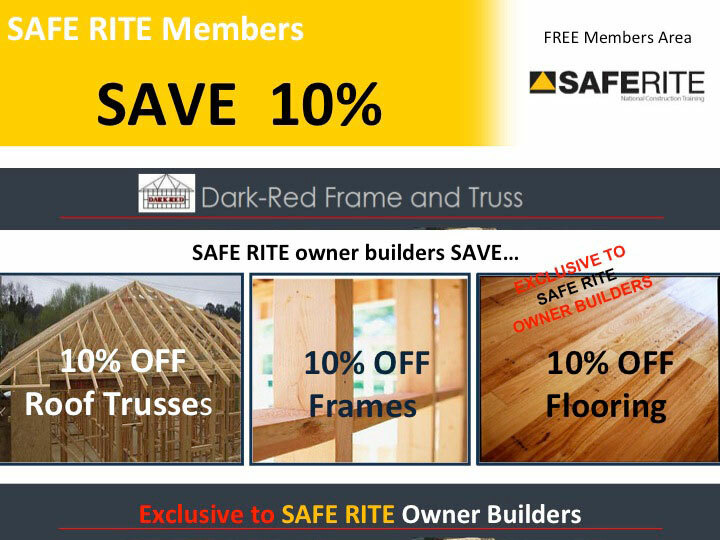 EXCLUSIVE to SAFE RITE Owner Builders. The SAFE RITE Owner Builder Project Management e-Kit is available FREE to all SAFE RITE Owner Builder Course participants. The images below, are screen shots of our pre-programmed Project Management e-Kit that consist of online calculators, e-Diary, cash flow manager and bar chart. The famous SAFE RITE Cash Flow Manager is yours FREE with your Owner Builder course. Used by accountants and financial planners , this easy to use cash management system will help keep track every dollar and help maintain your budget. Our 20 PAGE Site e-Diary is yours FREE with your Owner Builder course. This e-diary helps you record your site activities, workers, contact numbers, insurance policies, sub contractors, site deliveries, simple site instructions and more. This site e-diary is indispensible for all potential owner builders who want an easy way to record and protect their interests. 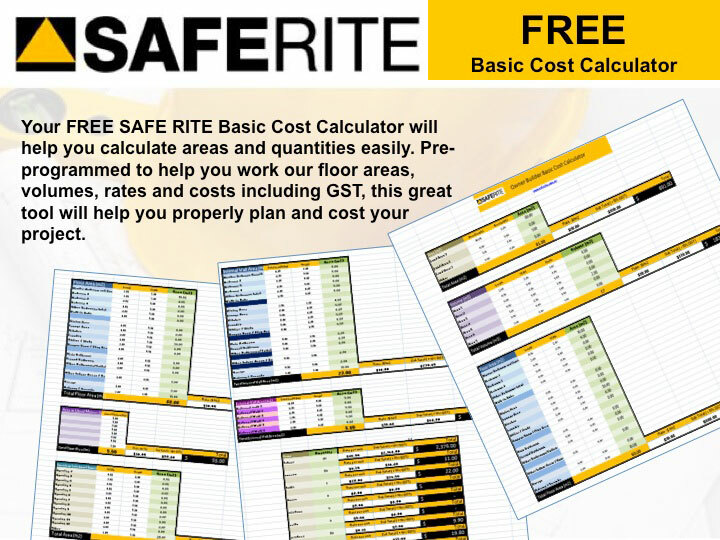 Your FREE SAFE RITE Basic Cost Calculator will help you calculate areas and quantities easily. Pre-programmed to help you work our floor areas, volumes, rates and costs including GST, this great tool will help you properly plan and cost your project. Your FREE SAFE RITE Area and volume calculator will help you with areas and volumes. Pre-programmed , simply add any dimensions and quoted rates, and your e-calculator will automatically calculate the area/volumes and total price including GST. Your FREE SAFE RITE Bar Chart will help you manage your project by properly planning and scheduling trades, services and materials. Fully editable, you can add / delete / alter all of your projects variables. Australia's leading Owner Builder Course if giving owner builders the ONLY FULL WHS Plan and safety system that is required under the WHS Act 2011. With the most comprehensive Safety System in Australia, compliance with the Act is now assured. 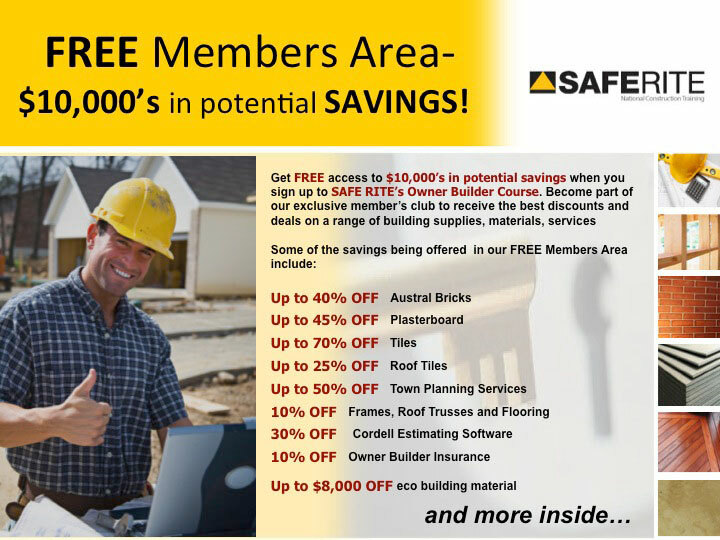 SAFE RITE is the only Owner Builder course provider in Australia with the experience in construction and safety to offer our owner builders a FREE comprehensive Safe Work Method Statement (SWMS) template. This SWMS blank template is designed for easy use and will help you comply with the new Work Health & Safety (WHS) legislation that came into effect in NSW on January 1st , 2012. Your SAFE RITE Project Management e-Kit is yours FREE with your SAFE RITE Owner Builder Course purchase.